Celebrate the luck o’ the Irish next Saturday, March 16 by watching the Mayor’s River O’ Green Fest from the best view in the house, on the Yacht Starship. See spectacular views of the Hillsborough River being dyed green for the annual St. Patrick&apos;s Day event held at Curtis Hixon Park. Board the ship in Channelside at 11:30 am. and enjoy a traditional Irish food buffet with corned beef, cabbage, potatoes, and Irish soda bread. 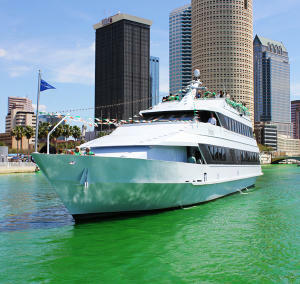 Cruise the "River O&apos; Green" from noon-2 p.m. while drinking green beer! Tickets are $49.95 for adults and $39.95 for kids and can be purchased online or by calling (813) 223-7999.